For the second straight year, the Scripps National Spelling Bee ended with co-champions. Each held onto one side of the golden trophy while they were showered with confetti. Vanya Shivashankar and Gokul Venkatachalam were the last two standing, having exhausted the 25 words reserved for the final three spellers without stumbling. Before last year, there hadn't been a tie since 1962. No one was surprised to see Vanya and Gokul dueling for the title. They came in with high expectations. Vanya, the longtime darling of the bee, is a five-time competitor and the sister of the 2009 champion and Gokulr had the trophy nearly in his grasp last year. But the tie shocked Paige Kimble, the bee's executive director and the 1981 champion. The director had predicted that another half-century would go by before the bee would crown two winners. As impressive as Gokul and Vanya were, she couldn't believe they'd make it through. Vanya, 13, of Olathe, Kansas, was the picture of poise. She smiled and nodded when she got a word she knew instantly, which was nearly every time. Her final word was "scherenschnitte." It means the art of cutting paper into decorative designs. His word was "nunatak," and Gokul didn't even bother to ask the definition before spelling it. For the record, it means a hill or mountain completely surrounded by glacial ice. Vanya appeared to struggle only with the Fijian-derived "thamaku." It is a type of outrigger canoe. Gokul smirked and the crowd groaned when he got the German-derived "sprachgefuhl." It means sensitivity to or conformance with the established usage of a language. But he knew it. The former champions in the crowd were left to marvel at how far the bee has come, even in the past decade. Vanya is the first sibling of a past champion to win. But Kavya, now a student at Columbia University, said Vanya is a superior speller. "Every year, they get better and better," said Anamika Veeramani. 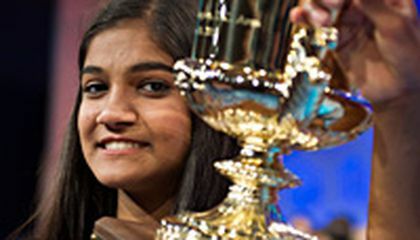 She won in 2010 and is now a rising sophomore at Yale. "One thing that kind of surprised me was how often they were asking for roots. They never did that when I was competing." Underneath his blue-and-white button-down shirt, Gokul wore the jersey of his idol, basketball star LeBron James. He hopes to attend Stanford and become an entrepreneur or stockbroker. But his immediate plans are to watch James and the Cleveland Cavaliers in the NBA Finals. Vanya is an aspiring cardiac surgeon. She dedicated her victory to her late grandmother and hopes to spend more time pursuing another passion, acting. She's also trying to talk her family into taking a Caribbean cruise this summer. The last 10 winners of the bee, and 14 of the past 18, have been Indian-Americans. It's a run of dominance that began in 1999 with Nupur Lala's victory, which was later featured in the documentary "Spellbound." Vanya and Gokul each will receive more than $37,000 in cash and prizes. While they held up the trophy together as they were being showered with confetti, each will get one to take home. This is amazing because its the second year in a row and because i'm also the first one to make a comment on this article. Wow 37,000 dollars is a lot of money , I wonder what Vanya and Gokul are going to do with all of that money, they must be really awsome spellers if they have made it this far in the spelling bee. I think they get better each year because when you are older you get introduced to a new range of vocabulary, and new techniques on how to spell better. This article talks about how two kids tied on the scripps spelling bee. The tie has happened two years in a row. This surprised many because the last tie happened in 1962. Although it had been expected that these two competitors would come close to the trophy no-one expected that it would again be a tie. Spellers get better each year because they learn from their previous mistakes. If they failed to spell a word the year before, they will study the word and how to spell and then be much better next year. Their vocabulary progresses as they age as well. They get better each year because of how they have to study study study. Each year they learn new words and remember the old ones, and they might get better at sounding things out or imagining how to spell it. No one was surprised to see Vanya and Gokul dueling for the title. They came in with high expectations. Vanya, the longtime darling of the bee, is a five-time competitor and the sister of the 2009 champion and Gokulr had the trophy nearly in his grasp last year, but the tie shocked Paige Kimble, the bee's executive director and the 1981 champion. The director had predicted that another half-century would go by before the bee would crown two winners. As impressive as Gokul and Vanya were, she couldn't believe they'd make it through. This article is about the Scripps National Spelling Bee. For the second year in a row this national spelling bee has ended with two winners. 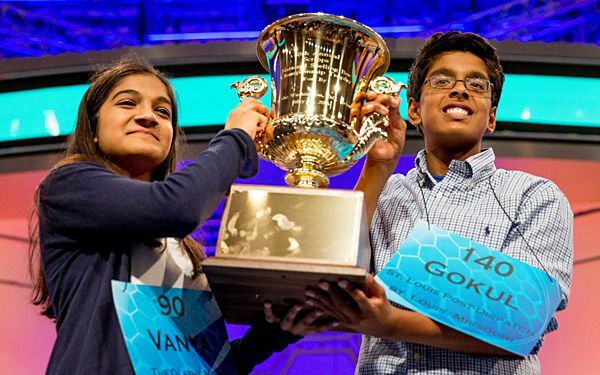 Vanya Shivashankar and Gokul Venkatachalam were co-champions to this years national spelling bee. Before, last years National Scripps Spelling Bee, there hadn't been a tie since 1962. Vanya and Gokul received more than $37,000 in cash and prizes. This article was really interesting to read, and I can't believe some people are so good at spelling such complex words. Two young teenagers compete in a spelling be and ends up having a tie. they both held the trophy and got 37,00 Dollars. I am happy for the two winners but I also feel bad. to go all that way and share a trophy? Now I know "sharing is caring" but when it comes to a trophy, I get all "grabby".